Absolutely agreed, just saying as this is a sticky and could be here for the next 300 years. If you have an older set next to your bed, the old fashioned dimmer that drops from 12v to 8v will work a treat with the old rice grain lamps, but an LED will pump out virtually as much light with the same +vcc drop. Mudslinger wrote: You don't have to diffuse them, I have found it makes very little difference. Iv'e never used an undiffused LED, So i cant make any comparisons, Only going by what iv'e read online, I just fitted one in my tiger that i diffused with sandpaper, And although one side is slightly brighter than the other its a vast improvement over the old filament bulb, It was that dim it almost went out when i keyed up. It's positioning that matters more. Don't point the LED at the front of the meter... point it up, and let the reflected light diffuse around the meter housing. It's also not as stupidly bright if you do this. You'll soon get sick of it and put in a proper bulb, you'll then see what the meter is doing once again. As most radios have 12v supply it's better to put 3 LEDs in series to help efficiency. 3 of them also helps diffuse bright spots. The 5mm LED format has been left far behind now in efficiency terms. Don't like these LED's in a signal meter, almost like looking directly at the sun. 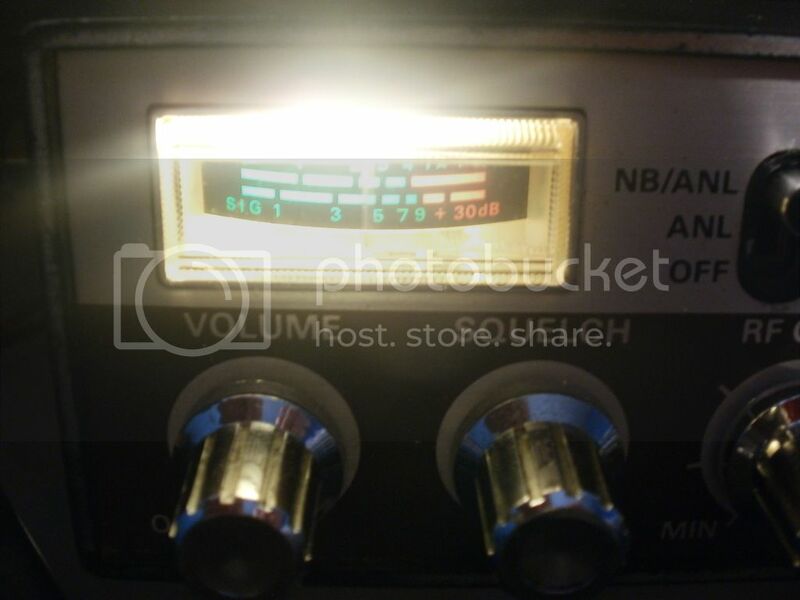 Tim wrote: Don't like these LED's in a signal meter, almost like looking directly at the sun. I bet you couldn't tell the difference if its done correctly with a warm white LED. The one above only looks bright because the radio was in a relatively dark setting when the picture was taken and the flash wasn't being used. It is a trick of the camera. Sorry but still don't like them. For posterity and for the benefit of our future users of Legacy radio's,go easy with the L.E.D's.Save money in the house on electricity but on a classic rig?NOOOOOOOOO!!!!!!!! !